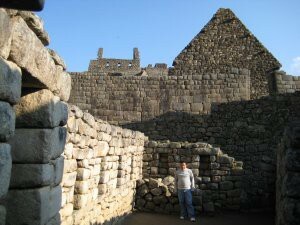 Exploring the Ancient City of Machu Picchu. 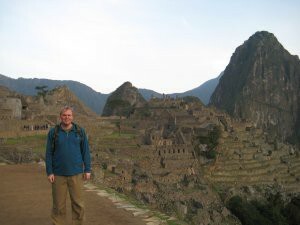 Having completed the Inca Trail, had a shower, and spent the night in a comfortable bed, we are given a whole day, to explore the amazing Lost City of Machu Picchu. The train carrying day trippers, arrives around 10am.Our Guide suggests getting the early bus, so that we can get there, when its practically deserted. I was quite looking forward to a lie in, but adventure called. 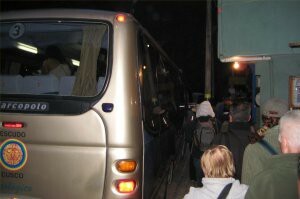 It was dark as we queue ‘d to get on the bus from Aguas Calientes. 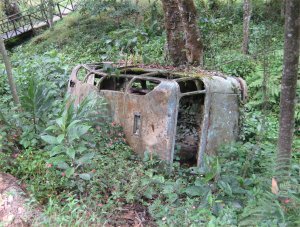 You can see just how quiet it was, when we arrived.Yale professor Hiram Bingham discovered the ruins buried beneath dense undergrowth in 1911. 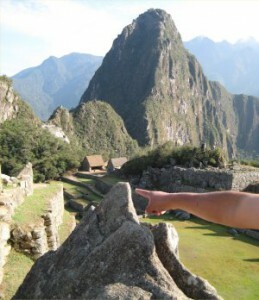 The first sight of Machu Picchu is almost magical. 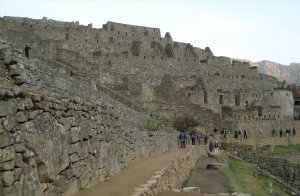 The temples, fields, terraces, and baths appear to be part of the hillside itself. Separated into three areas – agricultural, urban, and religious – the structures are arranged so that the function of the buildings matches the form of their surroundings. As we look across the valley, I see the famous Putucusi (2,600m). I prefer its local name, “happy mountain”.Its shape reminded me of earlier in the trip when we visited Coricancha. The Incas had been forced into Roman Catholicism, and painted religious pictures with women with strange shaped dresses. 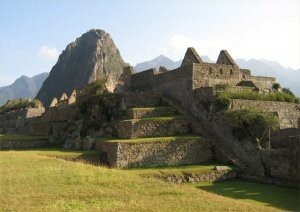 These were actually the shape of mountains like this one, which the Inca’s originally worshipped. The Sunrise of Machu Picchu.I have always found anything involving the Sun rising/setting over anything famous, to be a let down. This was different. As I took this picture, a person with a bald head was standing nearby, and the Sun shining of his head, was blinding. 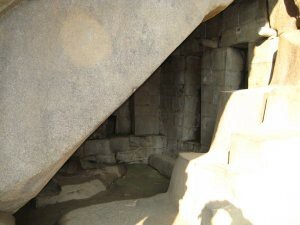 The Temple of the Condor is ingeniously created from a natural rock formation resembling the outspread wings of a condor in flight.On the floor of the temple is this rock carved in the shape of the condor’s head and neck feathers. 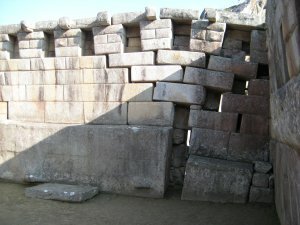 Historians speculate that the head of the condor was used as a sacrificial altar. 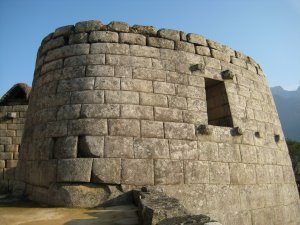 The Royal Tomb.A mummy was found under here. 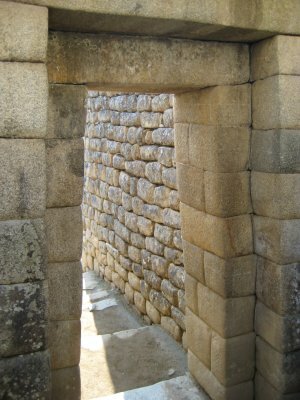 Our guide explained that a double doorway like this (with an inner and outer doorway) was an indicator, that the person who lived here was of significant importance. 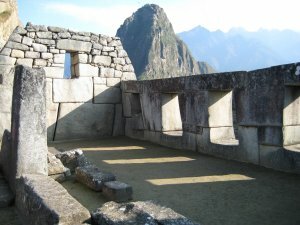 The Temple of the Sun (on the right) and surrounding buildings, showing the tongue and groove construction used by the Inca’s. The temple of the Sun is one of the most recognised ruins in Machu Picchu.It was explained to me, but I never completely understood, why it was round. Botanical Garden.A modern and not particularly inspiring selection of plants in a moderate sized flowerbed. It was still nice to some of the local flowers we had passed on the Inca Trail. 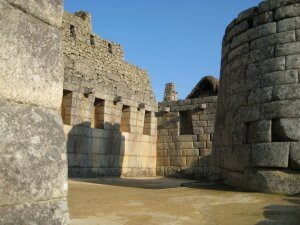 Central Plaza, a large grassy field that separates the Sacred Plaza and Intiwatana from the more commonplace areas on the far side. The Sacred Plaza.You can see the array of different types of building in this shot. 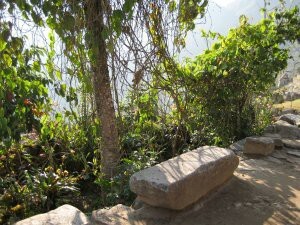 It sort of captures this diversity shapes within Machu Picchu. Next to the Principal Temple is the Temple of Three Windows, named by Hiram Bingham for its three identical, trapezoidal windows that open into the main plaza. The Principal Temple inside the Sacred Plaza is an example of excellent Inca stonemasonry, with its large stone blocks polished smooth and joined perfectly.The Inca used no mortar to hold their walls in place; they relied upon precisely cut stones, geometry, and female and male joints in the corners and foundations. 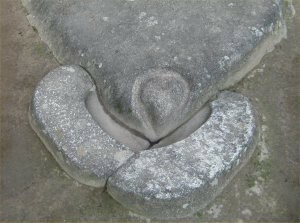 Their best-built structures withstand the passing of centuries, and even multiple earthquakes, without suffering.The jumbling of the stones in one corner is due to the settling of the earth over the years, and not to any defect in construction. 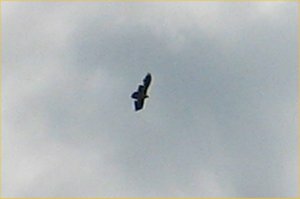 With my camera on maximum zoom, I get this (admittedly small) picture of a Condor, flying over Machu Picchu. 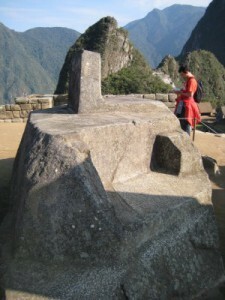 The Centrepiece of Machu Picchu. 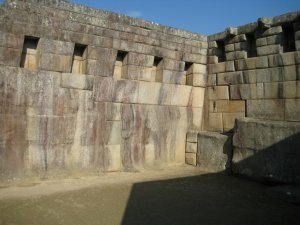 Intiwatana or “hitching post of the sun” is a carved rock pillar whose four corners are oriented toward the four cardinal points.The Inca were accomplished astronomers, and used the angles of the pillar to predict the solstices. During the filming of a beer advert, a crane, dropped a 1000lb weight onto it, and it was damaged (not badly, but this is a priceless relic). Its now cordoned off, with rope, and you aren’t allowed to touch it. This is a shame, as many people believe it connects heaven and earth. In the background Huayna Picchu or little peak.Its possible to climb up here (it takes an hour to the top) and get spectacular views of Machu Picchu. 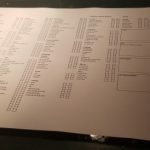 Problem is, only a certain number are allowed to do it, and like a nightclub, once a certain number are there, everybody has to wait until someone comes out. This means you can end up standing there for ages doing nothing. At the bottom of the picture is a small rock, with is said to be an exact replica of the mountain (not sure how much I believe that). Our guide Carlos (no, this man doesn’t need the toilet).The prison complex stands directly behind the temple, and is comprised of human-sized niches and an underground maze of dungeons. 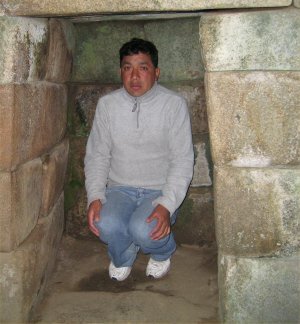 According to historical chronicles that documented similar Inca prison sites, an accused citizen would be shackled into the niches for up to 3 days to await the deliberation of his fate. 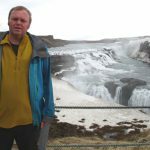 He could be put to death for such sins as laziness, lust, or theft. Carlos wasn’t guilty of any these, so we let him out after a few minutes of laughing. 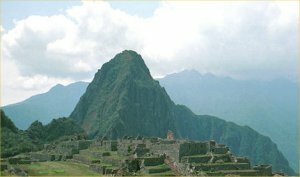 At the far end of Machu Picchu is the Sacred Rock, an object common to every Inca village.Many people today feel that Machu Picchu is one of the Earth’s magnetic focal points, and carries an inherent spiritual or metaphysical power. 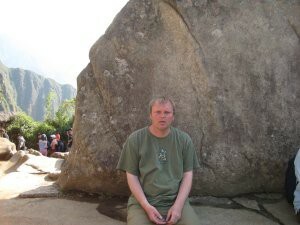 Indeed, it is difficult to sit at the edge of the Sacred Plaza overlooking the Urubamba River below, the stone temples and plazas to the front, and the mountain peaks of Machu Picchu and Huayna Picchu to the left and right, and not feel the magic. I was too tired to feel an “energy” I just wanted to sit down. 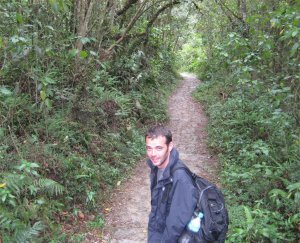 After a couple of hours, we decide to wander back to Aguas Calientes.Danny’s enlightened face, illustrates that the morning had been enlightening. The road used by the bus downhill zigs and zags, but the path, runs in a straight line through a series of forests. One of our group decided to travel on the coach. We joked about how funny it would be if he passed us on the way. At that exact moment, he did. 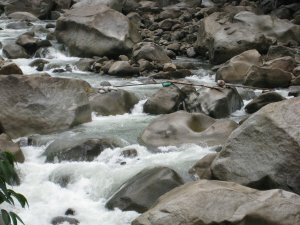 As we continue along the road, we see this wild river.If you look carefully, you can see a series of planks held in place with rocks, used as a bridge. As an engineer, I am comfortable with improvisation, but I wouldn’t have trusted my life, to that construction. To the right of the track, this VW camper van had come off the road some years before.We couldn’t find out any details, I just remember hoping that nobody was hurt. 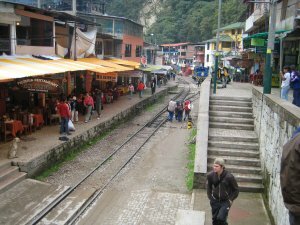 The main street of Aguas Calientes, where the train from Cusco cuts through the centre of the City.The girls did some more shopping, and Dan and I grabbed a table and relaxed with a couple of drinks (and no food). 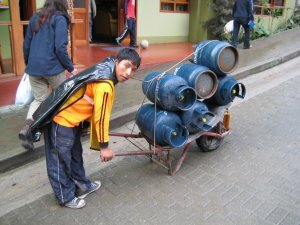 I walked back up the hill to our hotel, to get our stuff and get the train on the first leg of our journey home.I saw this poor guy pushing these heavy gas bottles up the enormous hill, in the centre of town.On his back, he wears a bin liner as a coat. Not for the first time, I am faced with a cultural dilemma. 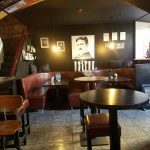 Should he envy me, because I come from a place with free hospitals, centrally heated houses and too him, endless comfort ?. Should I envy him for living in one of the most beautiful places in the world ?. I think in quality of life terms, we should all strive to better ourselves, but celebrate what we have.